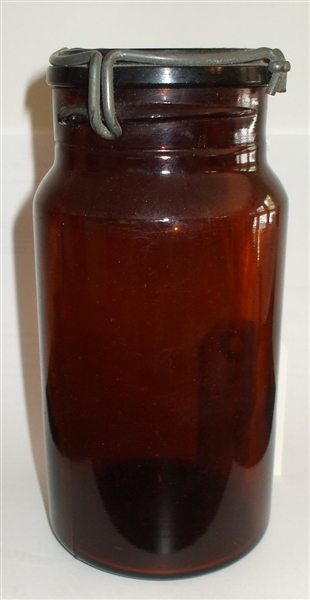 A dark amber bottle marked on the bottom, “P.Lorillard Co.”3-14” diameter, 7”T, with a twist lid. The lid is marked”Geo. W. Hilme Co. of New Jersey, Patented July 16, 1872.” The George W. Helme Co., of 111 Fifth Avenue, claims to be the oldest snuff company in the courtry. It was founded in 1825. It eventually went into the American Snuff Co., a subsidiary of American Tobaco, along with the P. Lorillard Co., which grew out of a company founded in 1760 by Peter Abraham Lorillard, the first man to make snuff on this continent.